The Club endorses the freedom of flight by permitting members to fly anywhere, any time, in almost any thing! Our only restrictive rule is that the aircraft flown must be in the "Light" category - less than 5,700Kg in all-up weight. So although the Club has a fleet of 26 aircraft in various Club liveries, members are not obliged to fly any of them! Members therefore often fly other favourites; sometimes we ask them to fly a specific type and for our Aerobatic displays, we have created low resolution (Lo-Res) models which anyone can download to reduce the processor load for spectators watching our flying displays. (How that works is explained on the VUK pages). So here are the aircraft we all love and fly. (Click on the pictures for larger versions). Feel free to fly them yourself, and if you are not a member of the Club - why not? The Club has created 26 aircraft liveries from G-CIXA to G-CIXZ for various freeware and payware aircraft, all of which are described and illustrated on this page. A second series G-ACIX to G-ZCIX is slowly being created as new and interesting aircraft become available. Because the first list G-CIXA to G-CIXZ is dominated by payware aircraft, the G-ACIX to G-ZCIX list will comprise mostly freeware aircraft. Yes, you can fly a Spitfire! Several members do - with our 2-4-CIX display team. We also have Hurricane and Messerschmitt pilots, and, by special permission for displays only, an Avro Lancaster and a Boeing B17 crew. There are many other favourites, many of them classics of the Golden Age of aviation, all skilfully and lovingly modelled by enthusiasts, most of whom we will never know, but whose work we in the Club very much appreciate. Opposite is a list of the 10 most recent flights by members. The Members' Aircraft page is a complete table of all active members' current activity within the last 3 months. It lists the active member's name and the most recent, and the most frequent aircraft flown, expressed both as total time and as number of flights. Occasionally, Club events feature particular or unusual aircraft which members are required to fly in accordance with the event rules. Sometimes members will find an unusual and interesting aircraft they wish to share with other members. Such aircraft will be found on this page. 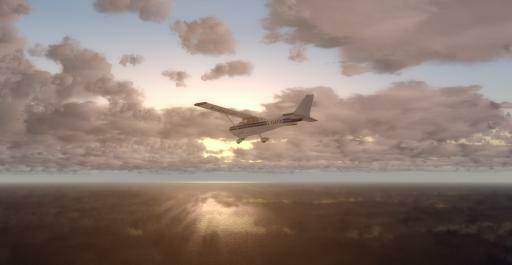 Low resolution model sets, created by James Mindham to enable CIX VFR Club Members and others to see the correct aircraft during displays and other online activities. Versions are available for users of Squawkbox and FSInn, FS9 and FSX. All details and instructions for use can be found on the Online Models page. Whoa! Don't run down the marshaller. This is the Lancaster from Plane Designs seen at Manston EGMH (Marshaller courtesy of Airports 2000 scenery). Two Tiger Moths supplied to the RAF in the first half of the Twentieth Century modelled for the Club Warbirds Group. Unzip the file (9.5Mb), and put the resulting folder unaltered into your FS9 Aircraft folder. When you open your aircraft list in FS9, under the de Havilland badge you will find these two after the 2-4-CIX Tigers (if you have them installed). In FSX put the folder in the Simobjects/Airplanes folder. Then make sure you have the "All variations" box ticked in the Select Aircraft display and you'll find these two shown individually. This aircraft was designed by Warwick Carter and modified by him for the Club. The RAF liveries and panels are by Peter Dodds.